I have a hard time getting excited about camping. There’s no electricity which means no AC, you sleep on the ground while bugs crawl in and around your face holes, and worst of all Pizza Hut does NOT deliver to an addressless location in the woods. Sounds like an episode of Fear Factor except Joe Rogan’s not there to cheer you on. But this Trampoline Tent is making me a little interested in giving it another go. On the trampoline end of things, I won’t be able to bounce off the edge and break my head open on a tree. And as for the camping aspect, I’ll have something to do while the others are holding hands and singing Kumbaya or whatever. No word if the tent is fire resistant, but it better be. I’mma be grillin’ up some dogs and making s’mores in there! You can’t think of anything else to do in a trampoline tent? Gotta have! Where can I get one in the US? 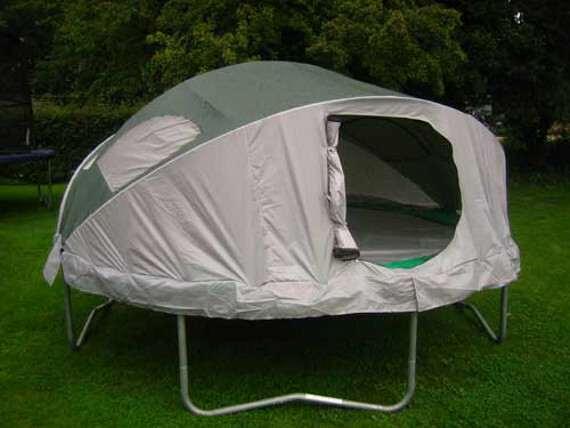 Where can I get a trampoline tent like this in the USA? Please help! I desperately need one! I have been trying to buy one of these and can not find anyone in the US that carries it, would love any help on finding one to purchase. I hit the buy button up top and a bunch of giberish shows up, hit buy on amazon and there isn’t any there. I would like to purchase one too… if anyone can find any for sale, PLEASE let me know! Look on trampolineusa.Com they have them for sale. I has one on our trampoline when my kids were young and they loved it. Only lasted a few years because of sun rot. It does fold up and down easily.